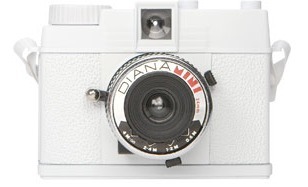 'For the easily distracted...' is having a Diana Mini week and with Lomography they are giving away a white version of this super cute camera! It takes 35mm film which is still pretty easy to find and get developed and it's small enough to fit in your bag wherever you go. It's a great way to get into fun film photography. I like mine so much it got a starring role in my title banner. All you have to do to enter is drop them a line saying which camera at the Lomography store you like best. Check out some of my Diana Mini pictures on my Flickr.